At Anabranch, we use the process of flooding and manipulating the timing, extent, duration and frequency of flooding to help restore systems. Many of our cues for how to tackle these challenges we've taken from more experienced ecosystem engineers - beaver. After centuries of failed attempts at 'flood control', it is now widely recognized that 'flooding' is needed to maintain healthy floodplains, riparian ecosystems and instream habitats. Much of the 'structural starvation' of wood and beaver dams, was done in the name of flood control. Removing obstructions to flow to increase conveyance during floods, has made many streams far more efficient drainage courses. However from a flood control perspective, this just passes the peak problem downstream to your neighbors, and attenuation is the name of the game now. Contemporary flood defence measures try to get people out of harms way, and give rivers and streams 'freedom space to flood'. 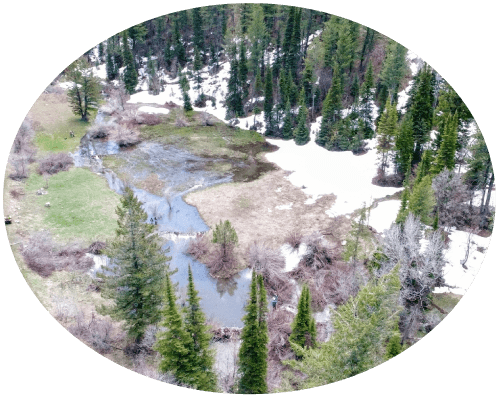 Moreover, floods are now widely recognized as critical and necessary disturbance agents in creating and maintaining complex and high quality habitat. Example of beaver dam induced flooding of a floodplain surface that normally would dry up. Using beaver, we can increase the frequency and duration that floodplains are inundated, making these valley bottoms more effective sponges. These sponges increase resilience to drought, fire, declining snowpack, and create far better wetland and riparian habitats for a multitude of flora and fauna.